New England coach Eddie Jones must think carefully before "writing off" Chris Robshaw, says Harlequins boss Conor O'Shea. Jones officially starts at Twickenham on Tuesday, and has said he will meet the 29-year-old before deciding whether to keep him on as England captain. 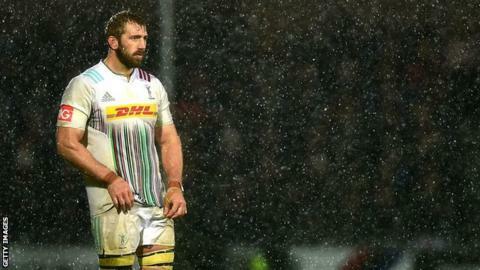 But, after Quins' narrow 26-25 loss at Exeter, O'Shea singled the flanker out, saying: "Chris Robshaw was outstanding. "I hope people take a long, hard look before they start writing him off." Jones' predecessor Stuart Lancaster departed following a disappointing World Cup campaign which saw England make a pool-stage exit. Robshaw, who has captained his country 42 times, has been criticised too for his performances in the defeats by Wales and Australia. But O'Shea praised his performance as Quins secured two losing bonus points from a dramatic encounter in dreadful weather conditions in Devon, which could have gone either way right to the last kick, as the visitors missed a late penalty. "He has been one of the outstanding back-row forwards in this country for many a year," said O'Shea. "I don't normally single out players but he made yards today when you didn't think he could make yards. "He was turning the ball over, he was tackling, he was working. I am gutted for us as a team, but I am incredibly proud of the performance." England's Six Nations campaign begins at Murrayfield against World Cup quarter-finalists Scotland on 6 February. Robshaw first captained his country in February 2012, leading England to impressive wins over New Zealand in late 2012, Australia in 2013 and 2014, and 16 victories in 20 Six Nations matches. Overall he has won 25 and lost 17 of his 42 matches as captain.